Earlier this month, DECA Advisor, Ms. Jessica Leary, accompanied three students to the New York State DECA Competition and Career Conference in Rochester. Junior, Tarek Karzoun placed in the top 10 for one of his role plays in the Entrepreneurship competition. Junior, Sarah Rolling, and Christopher Burgio, Sophomore, earned 1st place in the Community Service Project event. This event required our students to complete a community service project, prepare a 30 page manual, and an extensive presentation which they presented to the judges at the conference. Sarah Rolling, Chris Burgio, and another DECA member, Marcianna Cardona came up with their community service project, “Project Pen Pal” to help ease loneliness and give people someone to connect with and talk to. They reached out and connected all 3 of our schools to each other and to 100 residents from area nursing homes (Greenfield and Lancaster Manor). They worked with the elementary Kindness Club, and had over 150 students involved at the elementary, 50 students from the middle school, and over 160 at the high school. This is an ongoing project that will continue throughout the rest of this year and into next year. It was a huge undertaking and very much a success for our students and the community. 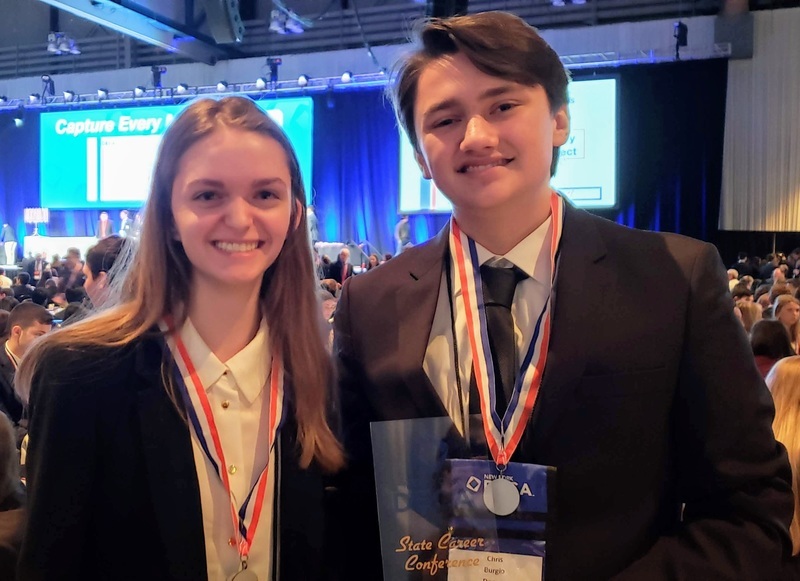 Sarah and Chris will be headed to Orlando in April for the national level competition. We are very proud of all the time, effort, and hard work our students put into preparing for this competition. Congratulations and best of luck at nationals!